Although we have been aware of Nan Montgomery's work for quite some time, this is the first exhibition of it at Addison/Ripley. Color rich, her paintings combine a pure geometry, in the tradition of Piet Mondrian, and style of Josef Albers and, more recently Burgoyne Diller and Al Held, with a seeming reverence of nature that, ironically, Mondrian processed away from. Mondrian began "...as a naturalistic painter and.....very quickly felt the urgent need for a more concise form of expression and an economy of means. I never stopped progressing toward abstraction." 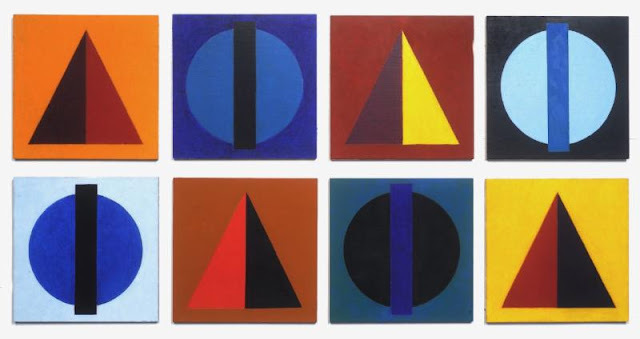 Montgomery clearly shares this aesthetic although her affinity for Malevich in this work, in particular is clear. The newest of the paintings in this exhibition have a dynamic quality, an implicit movement and, at the same time, measured strength. Whether in smaller scale egg tempera or the much larger oils on linen, these are the boldest, most assertive works by the artist to date. Strong titles like "Intersection", Decision", "Circlet" and "Cadence" and equally firm compositions demonstrate Montgomery's mastery of her medium and her art. Montgomery's "less is more" credo is evident in an exquisite collection of small works included in this collection. In a recent essay by Jean Lawler Cohen, the critic notes an evolution to the mature artist Montgomery has become. "But now an accommodation prevails, as if the painter has negotiated a temporary truce between impulses. Hard-edge blocks and stripes advance across dark or light grounds, ensuring a stability that holds until the peripheral insertion of a softer, textured vertical. Indigo, for years her darkest, near-black signature color, still appears but, at times now, co-exists with a new velvety black. Early, outright, heraldic encounters seem to have given way to more contemplative engagement. " After attending the Boston Museum School of Fine Arts and graduating from the Yale University School of Art with a BFA, the artist moved to Washington and took classes at the Corcoran School. Nan Montgomery has been an essential member of the Washington Art Community for more than 30 years. Her work is represented in the permanent collections of the Corcoran Gallery of Art, the Watkins Collection of the American University Museum at the Katzen Arts Center, the Washington Post, the Artery Organization, the American Federation of Teachers, the Washington Convention Center, The Federal Reserve Board, Washington, DC, as well as in private collections. Committed to abstraction and purity of form, her work is unified in the dichotomies of natural and material, restriction and freedom, hard edge and soft, all consistent with her personal history.